I sometimes refer to myself sardonically as an F.B.I. But in this age where tribalism may be defining much of the resurging cultural wars, I have to admit that I’ve grown up both fiercely connected to my Filipino roots yet also strongly detached from certain cultural wellsprings. In Hawai‘i, you rarely refer to yourself as a hyphenated-American. We’re Filipino. Or Hawaiian. Or Japanese. Or Portuguese. Or Scots Irish. Or some combination of the various peoples who now call the islands home. My own mindset is part of my upbringing—I grew up during the slow winding down of plantation life on Maui. My parents purchased a 12th Increment home in Kahului at the tail end of the Dream City era. But I continued to live in our old house in lower Pā‘ia with my grandparents. I couldn’t help being Filipino. Upon his retirement from the hotels, my grandfather decided that he would only speak Ilocano around the house and my grandmother, who arrived in 1963, never learned the language. As a result, I grew up the typical Hawai‘i-born Filipino, speaking English (pidgin and standard) to my family and friends, but understanding the dialect they directed back to my sister and me. My use of Ilocano today remains largely sporadic and undoubtedly provides moments of amusement and sometimes surprise to my fluent relatives. What always seem different from other Filipinos was faith. My parents, unlike many of their friends, were not members of a Roman Catholic Parish. Instead, my father’s people were Aglipayan and attended Ilocano language services at the Filipino mission meeting at Good Shepherd Episcopal Church in Wailuku. Although practicing similar High Church liturgy, the Philippine Independent Catholic Church did not follow the Bishop of Rome. Filipinos on Maui today practice in various faith traditions but most continue to maintain historic ties to the Roman Catholic Church. Christ the King in Central Maui, like St. Anthony’s and Maria Lanakila, have a fairly large number of Filipino parishioners and registrants among the Portuguese and Hawaiian faithful. Christ the King, moreover, has been blessed with Pastors over the last decade or so from the Philippines. For people outside the community, Catholicism remains a mark of being Filipino. The Church of Rome boasts 74 million members in the Philippines. Aglipayan, the second largest Christian denomination counts between six to eight million members, mostly in Northern Luzon and the Ilocos regions. So when a local Parish celebrates a milestone, it’s kinda serendipity that it begins during October, which is Filipino-American History Month. The Christ the King community marks 85 years worshiping at its location at the corner of Pu‘unēnē and Wākea in Kahului and will conclude its grand celebration with a special mass featuring Bishop Larry Silva on November 26. ‘Īao Congregational Church recently welcomed a new pastor just three years before celebrating its 125th anniversary. In 2016, both Wailuku Union Church and Good Shepherd Episcopal Church marked 150 years of Christian services in Wailuku. I grew up going to weddings and funerals at the old Christ the King Church adjacent to the elementary school and Convent. Constructed in 1932 with the help of the plantation and its workers, the old church was built in the style of a California mission—different from the other wooden Roman Catholic Churches in Wailuku (St. Anthony’s) and in Makawao (St. Joseph’s), or the solid structures of St. Rita’s in Pā‘ia or St. Theresa’s in Kīhei. Above the altar was a larger than life-sized portrait of Christ the King that was painted by its first Pastor. Like St. Joseph’s and St. Anthony’s, Christ the King also had a school. King Kamehameha IV and Queen Emma invited the Anglican Church to the Kingdom in the 1860s and established Good Shepherd with a grant of the lands it now sits on. In local church history, the monarchs, worried about growing American influence which favored annexation into the United States, invited English missionaries as a counterpoint to the New England Protestants and their descendants. In the plantation era (after annexation and the overthrow of the Hawaiian monarchy), the sugar companies played a similar role in the growth of certain churches, including Christ the King. 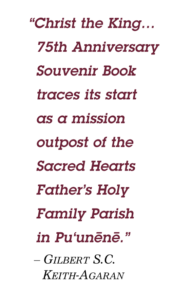 The Parish 75th Anniversary Souvenir Book traces its start as a mission outpost of the Sacred Hearts Fathers’ Holy Family Parish in Pu‘unēnē. For much of plantation era, Pu‘unēnē and Pā‘ia were two of the largest towns on Maui. Until the 1920s, Kahului remained a fairly small village with few Catholics. As the congregation historians recall, in late 1929, Annie Enomoto approached Frank Baldwin, manager of the Kahului Railroad Company and HC&S, to request land to build a church. The plantation manager offered Father Bartholomew Bax, SS.CC, pastor of Holy Family Church in Pu‘unēnē, a piece of beach front property near the Kahului Harbor. The Holland native, however, worried about the chance of a tidal wave, asked for property further inland. The plantation, for $1 (and a clause that the land could not be sold), granted an area along the main highway. Today, Christ the King Church still anchors the corner of Wākea and Pu‘unēnē Avenue. The site offered originally is where the Seaside and former Hukilau Hotels are located. Msgr. Stephen Alencastre blessed the new Church on the feast of Christ the King, October 30, 1932. With the planning of “Dream City” by Alexander & Baldwin, Fr. Anthony O’Brien purchased four and a-half acres of land for a school and the first wing was constructed under Fr. Joseph Putnam in 1955. By 1966, the parish had 700 Catholic Families. The school, for much of its operations as an elementary school though 2012 was staffed by the Sisters of St. Joseph of Carondelet. Today, only the pre-school remains in operation. By the 1970s, successive Pastors and parish leaders began work and fundraising to expand the nave and aisles. Expanded into the shape of a cross, the nearly half-million dollar renovation kept the Spanish Mission architectural feel. Bishop John J. Scanlan blessed the enlarged Christ the King Church on April 12, 1981. The history since the new church dedication has marked some endings as well as a change that reflects the demographics of Hawai‘i and Maui. 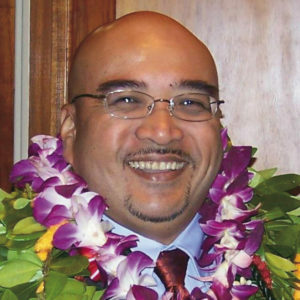 Gilbert S.C. Keith-Agaran, a full-blooded Ilocano (FBI), attended Doris Todd Memorial Christian Day School and regularly went to Pā‘ia Baptist Church as a child. He serves as the State Senator for Central Maui and worships at Good Shepherd Episcopal Church in Wailuku. The background and history of Christ the King was provided by Lucy Peros and adapted from the 75th Anniversary Souvenir Book of the church. 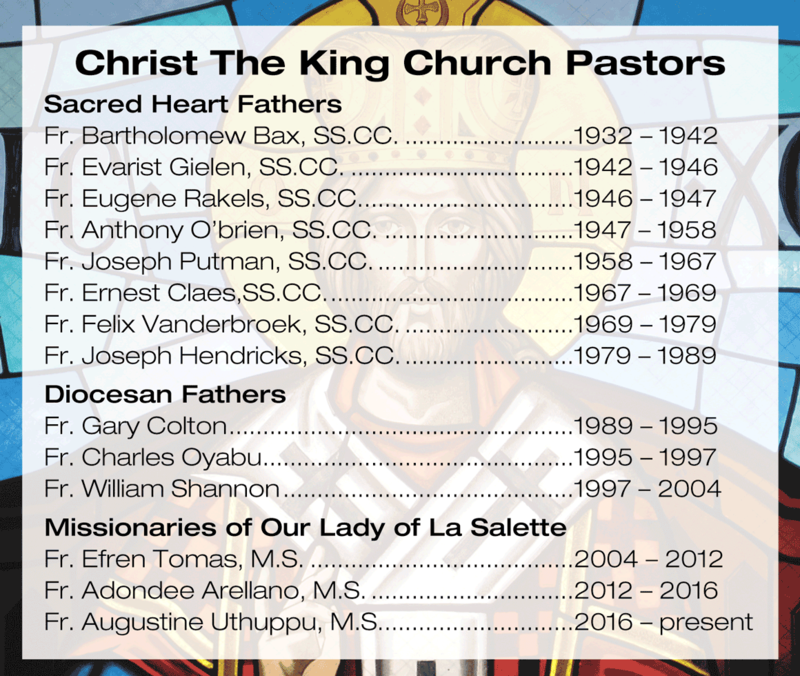 In 1989, Christ the King’s ties with the Sacred Heart Fathers ended with Father Hendricks’ departure. Served by Diocesan Priests during the interim, for over a decade now, the Missionaries of Our Lady of La Salette have been given authority over Christ the King. Pastors from that order have been provided from the Philippines. Fr. Efren Tomas, M.S. was the first administrator in 2004 and later presided on as pastor. Two other priests of the order, Fr. Wilfredo Iminga, M.S. and Fr. Ronald Guzman, M.S., also arrived to help. In 2012, Fr. Adondee Arellano M.S. became the pastor until leaving for an assignment in another community associated with Filipinos: Waipahū, O‘ahu. Presently, Fr. Augustine Uthuppu, M.S., serves as Christ the King Church Pastor with Fr. Edwin Conselva, M.S. as associate pastor. Today, Kahului includes 3,707 registered Christ The King parishioners, and 1,685 registered families. As the Christ the King family celebrates another milestone, it’s useful to reflect on how much traditions (and yes, faith) still maintain community ties. As someone who has grown to appreciate the almost-Roman Catholic liturgy of the Episcopal/Aglipayan tradition, I can celebrate with them this landmark.